Matt Murdock's job is as a lawyer. More specifically a defense attorney - but this job makes no sense if he wants to put criminals behind bars. In fact we have seen him defending criminals whom he knows are guilty and making the legal system find them innocent! Hardly the act of a noble soul. For Lucifer, Prince of Lies, a lawyer would be a perfect profession, and of course he would find great use in letting evil criminals walk free. As Daredevil, he goes after crime on the streets, paying special attention to those who escaped justice in the courts. But then again, these are criminals who Daredevil already let go. By beating up these criminals, Daredevil proves to the world that God's justice is powerless, and that only acts of vengeance will suffice. This is the perfect act for the Devil, as it tempts people into taking the law into their own hands (like Daredevil does) and turning their back on authority and the church as they see the Devil is the one protecting them. In the Marvel universe, the Devil is a real concept. Hell is real and there are plenty of evil Satanic figures lurking about, each of them with a claim to being the real devil. That's where Ghost Rider got his powers from, after all! Is it that much stranger to believe that Satan lurks around Hell's Kitchen at night, and by day is disguised as a lawyer who helps to free criminals? Is that crazier than a man with a flaming skull for a head? Of course, this is all mostly circumstantial evidence. However a tantalising clue comes in the new television show. When the evil Russian gangsters meet their comrade in hospital who has been beaten up by Daredevil, the man tells them that he was attacked by "the Devil". At this point he is with friends who wish to help him, and he has no reason to lie. An additional clue in the television show is how Murdock sees the world - we have a POV shot of a "world on fire", showing flaming, satanic imagery all around him. Murdock's powers don't make sense either. He is blind yet possesses amazing, almost supernatural fighting ability. The accident that caused him to go blind was the same accident that created the Ninja Turtles. From that event we know the effects of the mutagenic ooze - they mutate animals, not gift individuals with super senses. Why would Murdock lie about this, unless it is a convenient excuse for his abilities. No, more likely is that young Matt Murdock died in that tragic accident, and Satan swept in to take his place! Why would Matt Murdock, an outwardly religious man, choose to dress up as the Devil as all things in order to defend the city? It makes no sense - unless Matt Murdock is his disguise, and the satanic figure that bounds over the rooftops of Hell's Kitchen every night is his true form. The Devil is getting closer to the centre of the Marvel universe. 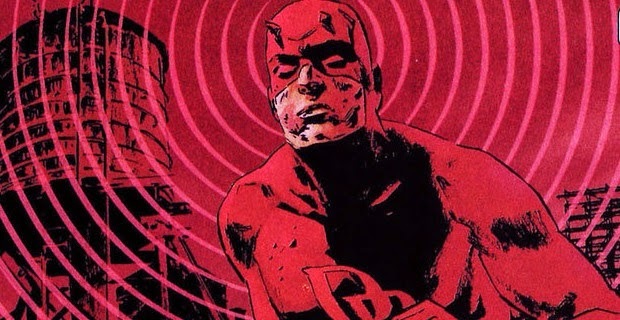 Will other heroes acceptance of Daredevil, or "Da Red Evil" as his name really is, open the doors to the apocalypse?